Simplicity at its best! This pasta is the perfect late winter/early spring dish. 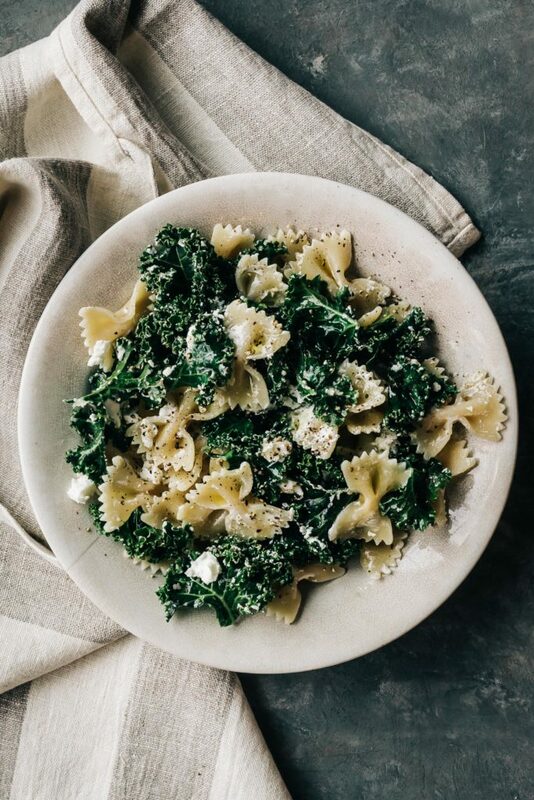 We’re picking overwintered kale here at the farm and used some fresh goat cheese from our “herd share” that melted into the hot pasta perfectly creating a creamy and tangy finish. The flavors in this dish are bright, satisfying and just what are bodies have been craving after a lot of heavy comfort food these past few months. I got the inspiration for this meal from my friends Sonja and Alex from the blog “A Couple Cooks” they just released their first cookbook “Pretty Simple Cooking” and this dish stood out to me because of its simplicity. I love when a dish that calls for so few ingredients is still packed with flavor. This is my favorite kind of meal and I hope you all give it a whirl too. If you’re looking for a new cookbook to inspire you in the kitchen I think you’ll love Pretty Simple Cooking. The recipes are approachable, delicious and healthy to boot. Thank you Sonja and Alex for sending an advanced copy of your book to me. You all did such a wonderful job creating a beautiful book. Bring a large pot of water to a boil. Cook the pasta until al dente. Drain and set aside. Heat 1 tablespoon of the olive oil in a large skillet over medium heat. Add the kale and cook, stirring occasionally until the kale wilts and becomes tender, about 3 minutes. Remove the kale and place it in a large bowl. Heat the remaining 3 tablespoons of olive oil in the same skillet over medium high heat. Add the shallot and cook, stirring often until translucent, about 3 minutes. Stir in the garlic, crushed red pepper flakes and a hefty pinch of salt and pepper. Cook for about 1 minute longer and then remove from heat. Add the drained pasta to the bowl with the kale, and top with the shallot/garlic mixture and mix with the goat cheese. Toss until evenly mixed, divide between bowls and serve with some freshly grated lemon zest. Wow this looks a LOT like the recipe in my first book (The Book of Kale) 😉 Glad you enjoy it. It’s not exactly the same but the boiling everything in the same pot, bows, kale and goat cheese are. Just sayin. Thank you SO MUCH for your kind words about Pretty Simple Cooking and your GORGEOUS rendition of this recipe, Andrea! This photo is so lovely. And I love seeing your swap of bow ties! Thank you so much for your support in all things. Sending big hugs to you and Taylor! Loved it ! I added spinach and black olives. Délicious ! Thank you !